Part 1 of a 4-part series in which a scientific researcher, Dr Amanda Dettmer, describes her entry into the world of legislation and public advocacy. It is important that the scientific community, and the scientists themselves, engage with science policy – policy makers are regularly courted by animal rights groups, and it is important that they also hear the voice of scientists. SfN Capitol Hill Day is the hallmark advocacy event of the year. SfN members from across the country convene on Capitol Hill to meet with their congressional representatives to discuss advances in the field of neuroscience, share the economic and public health benefits of investment in biomedical research, and make the case for strong national investment in scientific research through NIH and NSF. Hill Day actually began the day before, when all SfN members who came to attend SfN Hill Day (either as citizens or as Policy Ambassadors) underwent a training session to discuss the Hill Day process, practice “elevator pitches” to give to legislators, and discuss strategies for particular types of scenarios that might occur. At the training we were divided into our Hill Day groups (there were 12) and given our meeting schedules for the next day. Each group was headed by a SfN staffer with prior experience at Hill Day. My group consisted of our SfN staff leader and five scientists: a postbaccalaureate research fellow, one doctoral student, two postdoctoral fellows (including myself), and a PI from a research institution in Mexico (even abroad, scientists know the impact of sustained funding for NIH and NSF!). Together, we represented West Virginia and Maryland – four lived and/or worked in Maryland, and the other in West Virginia. The morning of Hill Day, all SfN Hill Day participants met for breakfast and for last-minute preparations before beginning meetings with legislators. I learned something in the morning about the geographical landscape of Washington, D.C., too – the buildings on either side of the Capitol house the offices of the more than 500 legislators who serve in Congress. Every single Representative and Senator has his or her own office, with a plaque on the wall next to the door displaying the state they represent, and typically the U.S. and state flags on either side of the door. 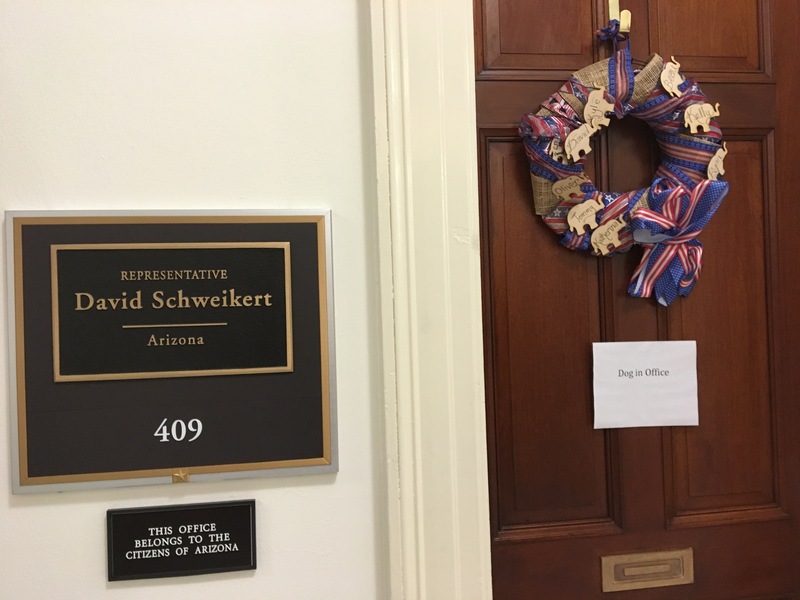 Some choose to add a little personal flair, like the Representative from Arizona who stated that his office was dog-friendly and had a sign alerting visitors that there was a dog in the office! So, our meetings were in three different buildings throughout the day, depending on if we were meeting with Representatives (buildings on one side of the Capitol) or Senators (buildings on the other side of the Capitol). There was a lot of walking…if you plan to attend a Hill Day in the future, be sure to wear comfortable shoes! In all cases, we met with the staff of each legislator, who was him- or her-self out of office. I learned that this is not uncommon, especially on days like ours when a last-minute vote was called so all Representatives had to go to Capitol Hill. Our first meeting was with a staffer in Rep. Chris VanHollen’s (D-MD) office. She was very interested (and was informed about) the closure of the NIH Poolesville facility, and I took the opportunity to underscore the need for consistent funding for humane, ethical animal research, and to emphasize the importance of animal models in scientific advances. I also emphasized the impact that the facility closure has on early career scientists and students – really, the next generation of science – who must now re-evaluate their career plans. 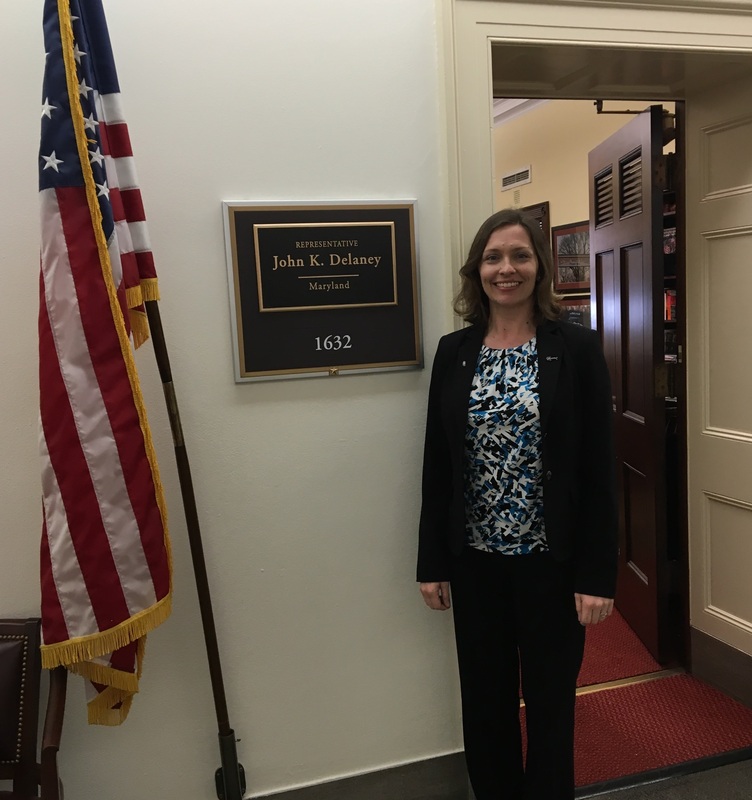 It was a rare opportunity to tell a legislator exactly how funding decisions impact the present and future state of science. Our next meetings were with Rep. John Sarbanes (D-MD), Sen. Joe Manchin (D-WV), Sen. Ben Cardin (D-MD), Sen. Shelley Moore Capito (R-WV), Rep. David McKinley (R-WV), and Rep. John Delaney (D-MD). In every meeting, we followed a fairly standard pattern of presentation, given that the legislators’ offices had such tight schedules. Our SfN leader, Sylvie Raver, would introduce herself and briefly give her science background, then the five of us would do the same. We would be sure to identify which of us was the constituent for that particular Congressperson, and you could see the staffer immediately hone in on that person or people. As a group, we’d thank the legislators for their past support for scientific funding (Maryland is very “friendly” to scientists, especially since NIH resides there, and the senators and representatives we met from West Virginia were also – but other states are less so and it becomes quickly apparent how advocating to your legislator in person can be very effective). We’d then recommend that they join the NIH Caucus or the Congressional Neuroscience Caucus, and ask that they advocate and vote for $34.5 billion for NIH and $8 billion for NSF in fiscal year 2017, as well as to continue to support the BRAIN Initiative at current and future recommended funding levels. With each legislator, we determined the best points in the conversation to discuss the value of humane, ethical animal research studies. Finally, constituents would invite the Congressperson for a lab tour, and we would answer any questions and offer ourselves as science resources before ending the meeting. Altogether, the experience was extremely enlightening, and really fun. It was energizing to be a part of the process and to advocate for science in a way I’ve never done before, in a way that feels like it might actually make a difference. And the best part is – you can meet with your Representatives in your own district; you don’t have to make a special trip to Washington D.C. I challenge every scientist to schedule at least one meeting in the next year with their Representative to advocate for science funding, and particularly, for the need for animal models in science. You’ll find that you’ll be well-received, you’ll have fun, and you’ll be more engaged than ever before. In most cases, it will be the start of a relationship with your legislator – you can contact them again with updates in your field, give them data to help guide their decisions, and serve as a resource for them for future votes. Following Hill Day, I will be conducting three outreach activities as part of my Early Career Policy Ambassadorship. I’ll be interviewing my Representative, John Delaney (D-MD), to learn the steps legislators take to devise, draft, and pass pro-science policy. I’ll also interview a science policy advocacy group, the National Association for Biomedical Research (NABR), to learn how they become involved in – and inform – the science legislation process. Finally, I’ll culminate my year with a poster at the annual SfN meeting that disseminates this information and specifically informs the public – including scientists – how they can become effectively involved in the process. All of these activities will be blogged as well – stay tuned for parts two, three, and four! There is not just one Hill Day. Organizations from all over the country schedule meetings in advance with their legislators to occur on one day. I saw members from the Sierra Club in the hallways during our Hill Day. Others might have their Hill Day later in March or in April. Legislators (and/or their staff) really do want to hear from constituents – they do not see it as a waste of time. Because constituents are voters, they take meetings with them seriously. There are Congressional and House caucuses specifically related to science that you can – and should! – ask your legislator to join. There is the NIH Caucus for both Representatives and Senators, and the Congressional Neuroscience Caucus for Representatives only. The Senate caucuses are informal – meaning they do not receive official recognition or funding from their chamber (the Senate). Congressional caucuses are formal member organizations within the U.S. House of Representatives. A complete list of congressional caucuses can be found here. Previous Previous post: Animal research and the University of Edinburgh: What does openness look like? Great advocating for animal research. I think it’s important not only to advocate for science funding but also for a reduction in science regulatory burden. When you become a PI you’ll understand why: a big chunk of our time is devoted to paper-pushing (much of it related to animal regulation). That’s a huge waste of scientific expertise (it took a lot of training to get to be PI) and money (the taxpayer pays for that expertise). Time that could be devoted to advancing science is wasted in bureaucracy.